Size/Color: Full/Gray/WashFull/Buttercream This item is currently out of stock! The Sand Dollar Bed is part of our Cape Cod Group. Windswept and rugged, crawl in and get away! Shown here in Gray Wash finish. 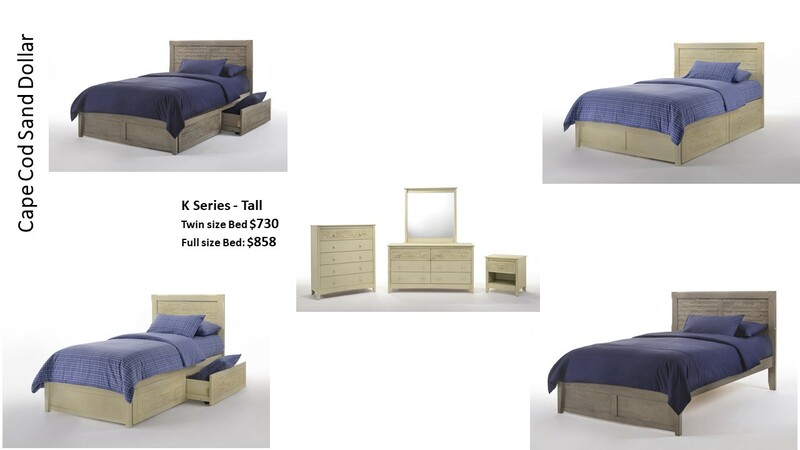 All Spices Bedroom Collection items come width a limited 10-year warranty. 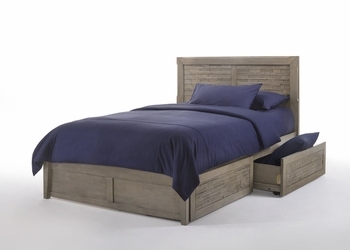 The Footboard Panel is a wonderful Night and Day Furniture innovation, and practically essential if you are using drawer storage underneath a bed. Beds come complete with 10 pcs of 1x4" mattress support slats and supported down the center with our rail and foot support system. The Bedroom Collection beds comes with a variety of useful and attractive accessories including our patent pending Folding Footboard Bench. Our models are beautifully finished with automated and hand-rubbed techniques for a rich and durable finish.